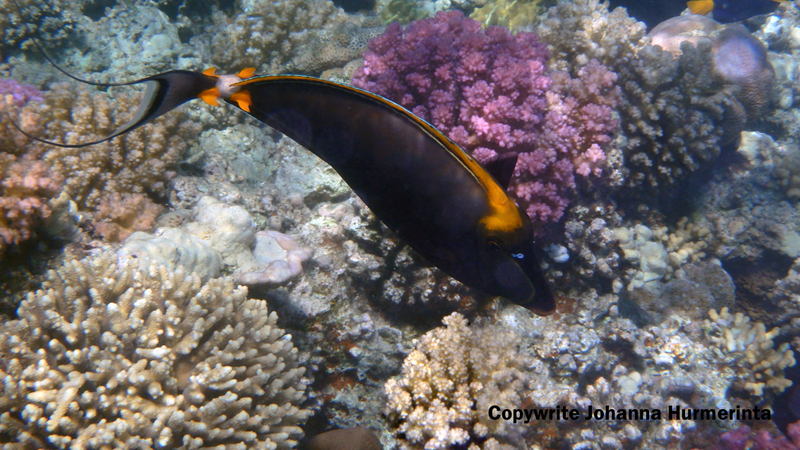 We have seen many fish in the Red Sea since 2011. We have seen more than 100 different fish and photographed nearly 100 species. Some photos look awesome, some look nice and some are not as great as we thought, due to the sand dust, dark areas or plankton. 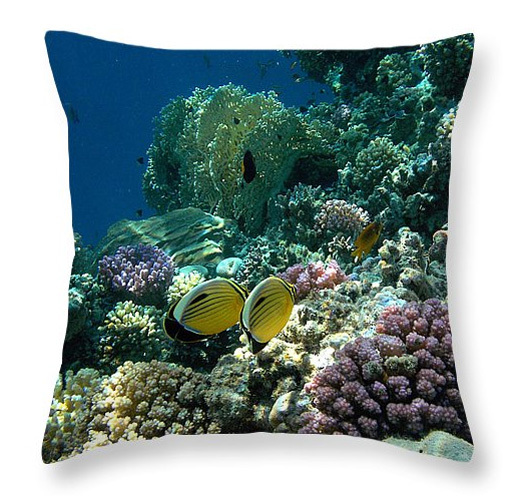 Photographing in the Red Sea is a dear hobby to us. We are not professionals with huge cameras and equipment. For our next trip we know of a few new tricks though, how to possibly get more amazing photos. ps. click on the photos and you see them enlarged. The Orangespine Unicornfish is a beauty. The black color is like velvet. The orange color is like art work on the fish. The blue eyes are like small diamonds. A smaller fish, the Sulphur Damsel, is bright yellow. Just like the summer sun. You recognize it from the black spot, which is a great contrast to the yellow color. 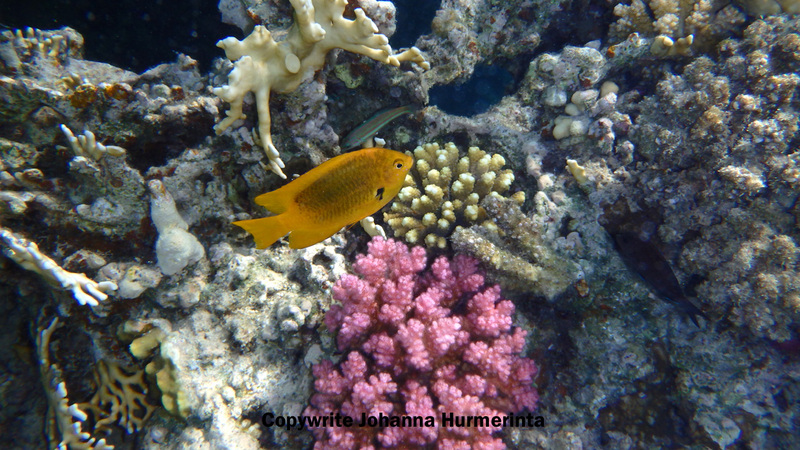 The fish likes to swim around the raspberry corals. I am pretty sure many people would love the new experience to watch the fish and the corals below the surface of the Red Sea. I recommend to try snorkeling. Buy your own mask and snorkel and dive into the amazing Red Sea. One of the funniest fish is the Masked Pufferfish. 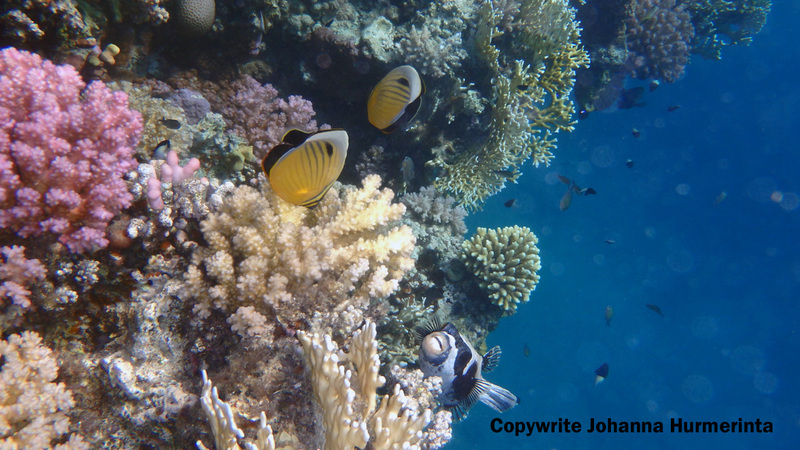 In the photo below it watches the photographer as well as the Exquisite Butterflyfish couple. Check out more fish photos in the previous blog posts.